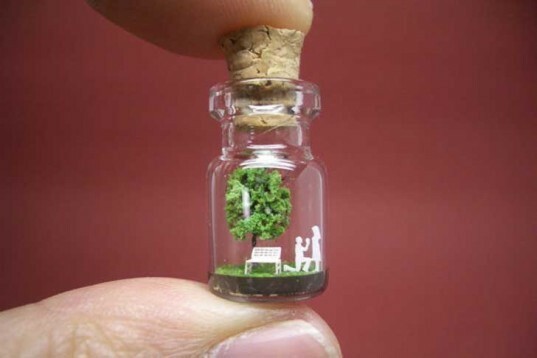 Tokyo-based artist Izumi Akinobu creates amazing miniature worlds encased in cute glass bottles. 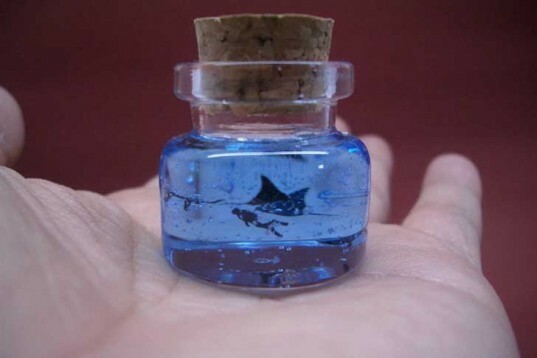 Izumi is an architectural model designer by day and a craft artist in her spare time, and she sells her delicate Tiny Worlds in Bottles through Etsy. Hit the jump to check out some of her most amazing works - like this cute paper bike under a tree - and remember that smaller and greener is always better! 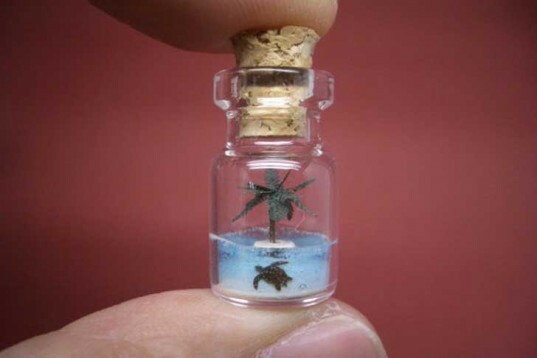 A super tiny turtle measuring only 0.1 inches swims near an uninhabited island with a palm tree. Instead of taking your loved one to Paris, why don’t you make it less obvious and propose with this bottle? A manta ray and a diver swim together in a blue tiny ocean. This piece of Africa in a bottle features a giraffe, an elephant, a horse, rhinoceros, an ostrich, and a deer surrounding by plants and drinking water. 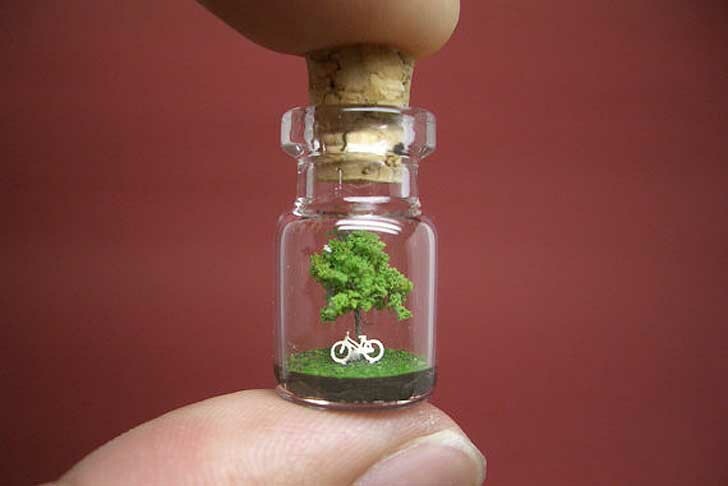 Izumi Akinobu’s tiny art creations can be worn as a necklace or viewed as tiny landscapes that don’t take up a lot of desk space. They cost about 25 dollars each and can be shipped from Tokyo to anywhere in the world. onde eu acho como faço pra comprar ?? Wow! These works of art are really cool! Instead of taking your loved one to Paris, why don't you make it less obvious and propose with this bottle? A gorgeous 0.5 inch jellyfish gently floats in bubbled water. Museums are not the only places where we can find a Tyrannosaurus Rex skeleton - focus your eyes and take a look inside this bottle. 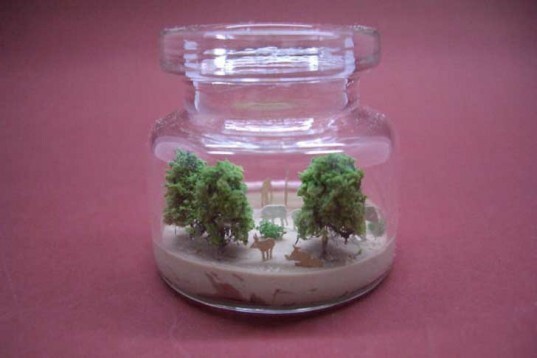 This piece of Africa in a bottle features a giraffe, an elephant, a horse, rhinoceros, an ostrich and a deer surrounding by plants and drinking water.